Built to LEED Platinum standards, CMTA office building is a recent example of sustainable commercial construction. Buildings, it turns out, are the largest single consumer of energy worldwide (about 40% of total energy consumed). And on a square footage basis, commercial buildings—because of their higher occupancy rates and code requirements—consume far more than homes. To address this, several initiatives seek to make commercial construction more sustainable and energy-efficient. Three of the most popular are the U.S. Green Building Council’s LEED program, the Passive House standards, and Zero Energy (ZE). These programs all share the goal of improved efficiency, but are significantly different. 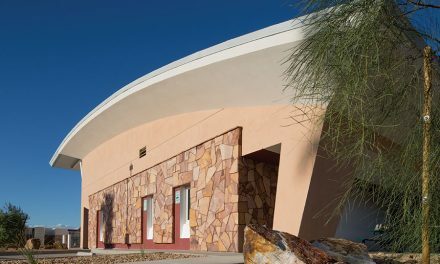 This type of building can be built quite affordably using readily available, “off-the-shelf” technology such as Insulating Concrete Forms (ICF). In recent years, dozens of these highly-efficient commercial buildings have been built across North America. Built at a cost comparable to traditional school construction, Richardsville Elementary saves about $155,000 annually in energy costs. A Zero Energy building is not only efficient, but also produces enough energy to meet all of its electrical, heating and cooling needs. Perhaps the most famous of these “zero energy” buildings is Richardsville Elementary in Kentucky. Designed by architectural firm Sherman Carter Barhart in 2008, the 77,000-sq.-ft. school features highly efficient ICF walls, careful site layout for passive ventilation and cooling, and a rooftop solar array. The cost was comparable to traditional school construction (approximately $193 per sq. ft. for Richardsville versus a national average of $190), and saves about $155,000 annually in avoided energy costs. While ZE commercial buildings are associated with schools, the list also includes office buildings and other types in a variety of climate zones. For more information, the Zero Energy Commercial Building Consortium (CBC) has a host of information. As stringent as Zero Energy standards are, Passive House standards demand even greater energy efficiency; structures so tight and efficient that only the make-up air needs to be heated or cooled. The movement has its roots in the 1990s when the first PassivHaus was build in Darmstadt, Germany under the guidelines set up by the PassivHaus Institut (PHI). The movement came to the United States a few years later as the Passive House Institute U.S. (PHIUS). Originally, PHIUS was the American branch of the European PHI, but in 2011, the two organizations split. One major point of contention is that the European PHI standard makes no allowance for differing climates. The PHI standard is simple: the building must have (1) an air infiltration rate no greater than 0.60 air changes per hour; (2) a maximum annual heating and cooling load of no more than 1.4 kWh per square per sq. ft., and (3) total energy use for all purposes not exceeding 11.1 kWh per sq. ft. The standards were originally developed for homes, but have since been applied to commercial buildings as well. When, in 2015, PHIUS introduced its own climate-specific passive building standards, it created a permanent rift between the organizations. The new PHIUS rules base efficiency on the number of occupants (rather than square footage) and consider climate in the allowable heating and cooling loads. Either way, developers now have to decide whether to certify through PHI or PHIUS. The first building in North America to be certified by Germany’s Passivhaus Institute is the 5,000 sq. ft. Waldsee BioHaus in Bemidji, Minnesota. It used Amvic ICFs for all exterior walls. The U.S. standard seems to be the most popular, with PHIUS reporting that 97% of all passive house projects in North America last year used the new PHIUS+ 2015 rules. 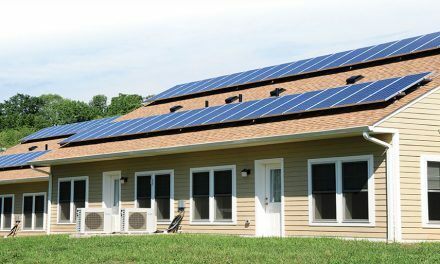 These rules make it simple to convert to Zero Energy, and certified projects automatically qualify for U.S. DOE Zero Energy Ready Home (ZERH) status. PHIUS+ 2015 projects also earn U.S. EPA Indoor airPLUS status for air quality. 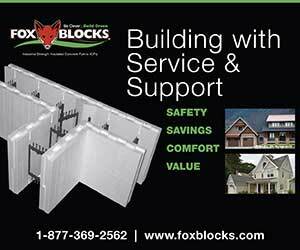 Not surprisingly, insulating concrete forms (ICFs) are a popular choice for passive house construction. 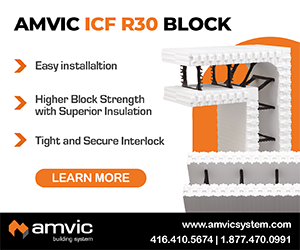 In fact, the first passive house in North America was built with Amvic ICF (See story in the October 2006 issue of this magazine, available online). 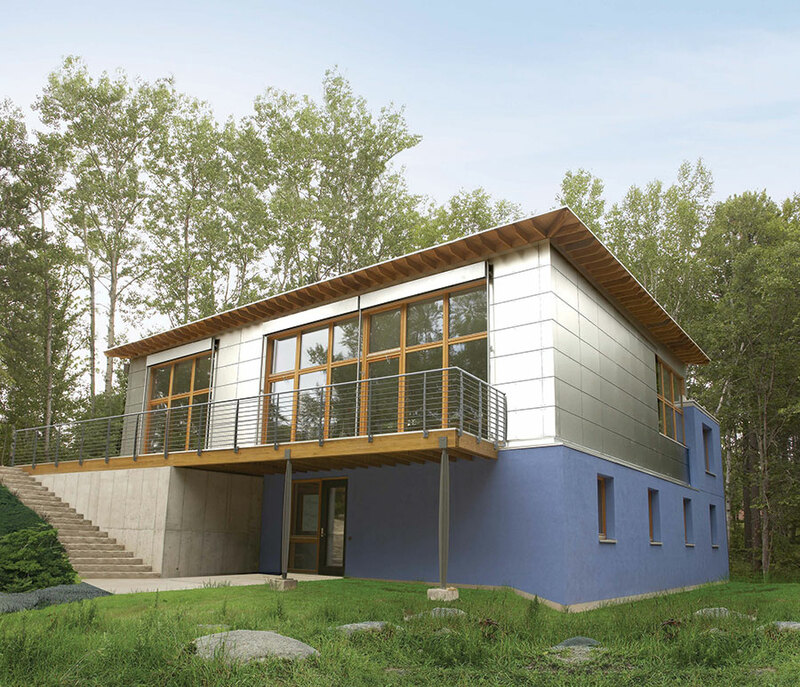 One of the most notable recent Passive House projects is also built with ICF. Completed just last fall, Beach Green North is located in the Rockaways, a coastal suburb of New York City on Long Island in the borough of Queens. Built at a cost comparable to CMU, Beach Green North meets the rigorous standards of PHIUS. 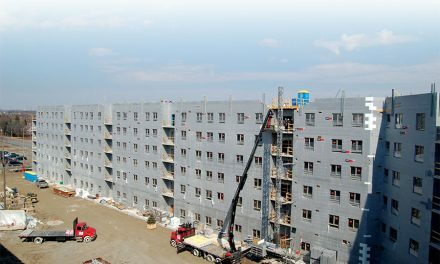 In 2010, they built a six-story ICF apartment complex that nearly met Passive House standards. Beach Green North was just the next step in efficiency. It proved to be surprisingly affordable. 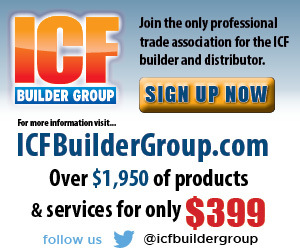 In the New York City market, ICF cost $18-22 per sq. ft. of installed wall, compared to the $28-32 per sq. ft. it would take to get a CMU wall to the same level of efficiency. Bluestone says, “This building is certified by the Passive House Institute U.S. (PHIUS). To date, it is the largest building in the world to have achieved certification by this organization. It is anticipated that the building will use 90% less energy than comparable buildings in the area. The total annual heating/cooling costs for the entire 108,000-sq.-ft. building would be in the range of $15,000 to $20,000 before taking into account the electricity that will be produced onsite. 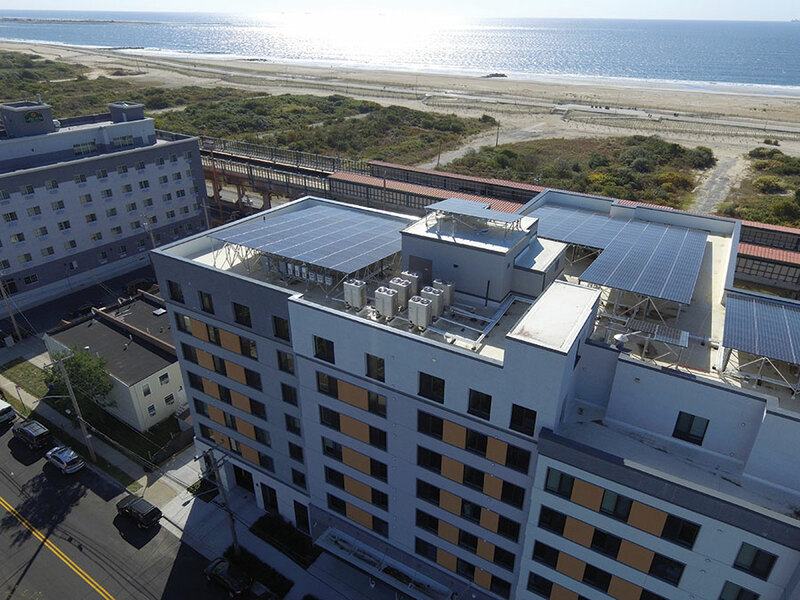 The roof is covered with a 133 kWh solar photovoltaic array system that will produce a substantial portion of the building’s energy needs, and a 10kWh combined heat and power generator (CHP or “co-gen” unit) was also installed. It will provide 100% of the building’s hot water needs using natural gas for fuel, and will also provide additional electrical power for the building. The co-gen unit will also double as a generator during grid outages. Each apartment is mechanically ventilated by individual energy recovery ventilators (ERVs). Bluestone reports that the total cost of all this technology works out to be about $233 per sq. ft., a price that includes the solar array and co-gen unit. There were construction challenges, most of which centered on the foundation. Built on a low-lying site just a few hundred feet from the Atlantic Ocean, the area was submerged under at least five feet of water when Superstorm Sandy came ashore a few years ago. FEMA standards required the lowest occupied floor of the building to be 4’ above the street grade. The owners set the first floor 6.5’ above the street grade, just in case FEMA got it wrong. To deal with the sandy soils, the entire foundation was constructed on wooden piles driven 30 to 40 feet below the surface of the site and tied together with massive grade beams and pile caps. Completed in September of 2017, the building was fully occupied almost immediately. More than 100,000 applications were received, and a lucky one in a thousand received a lease. Despite an elevated NYC rail line that runs just 60’ away from many of the apartment windows, tenants comment on the comfort and quiet. ICF Use: 79,140 sq. ft. The USGBC’s LEED program is the oldest and most widely used green building standard. Unlike ZE and PHIUS, which focus primarily on energy use, LEED certification involves the use of eco-friendly building materials, site use, water conservation, and proximity to mass transit. The latest iteration, LEEDv4, has categories for new construction and remodeling, residential and commercial, and LEEDv4.1 is under development and currently open for public comment. The program has four different levels: certified, silver, gold, and platinum. ICF projects have been scored at all four levels. 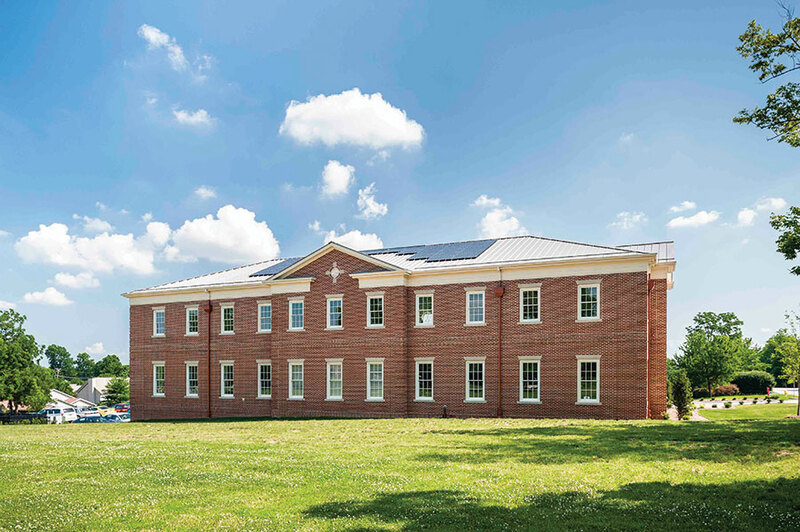 One of the most interesting and recent LEED Platinum commercial projects is the CMTA Office Building in Lexington, Kentucky. Built as the headquarters for a local engineering firm, it was completed in June of 2013. CMTA is known nationally for its high-performance sustainable designs, and these were showcased in their Lexington headquarters. The site location was selected due to its proximity to clients, the University of Kentucky, and easy access to interstate traffic. The sustainable design features serve as an active illustration of their core values and design beliefs. Energy-saving features include ICF walls, geothermal heating and cooling with variable speed geothermal heat pumps, daylighting, LED lighting in offices and lobby area, solar photovoltaics, and individually metered building systems including HVAC, receptacles, and lighting. Ten vertical wells, each 350 feet deep with 1-1/4″ piping provide the equivalent of 17 tons of heating capacity. Lighting systems consume only 0.56 watts per square foot. The 8.58 kW photovoltaic system on the southeast-facing rear roof provides 16-20% the annual power usage. 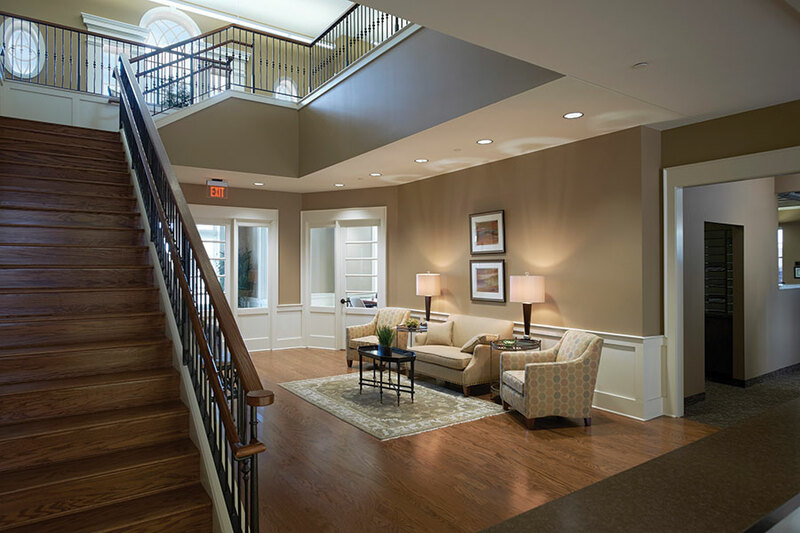 The notebook adds, “In addition, ICF walls meant our building was constructed more quickly which saved time and money on the project.” In total, the project came in at around $246 per sq. ft., and utility bills for the 11,750 sq ft office have averaged about $590 monthly. Designers deliberately chose a fairly simple, rectangular design to reduce construction costs and facilitate a tight building envelope. 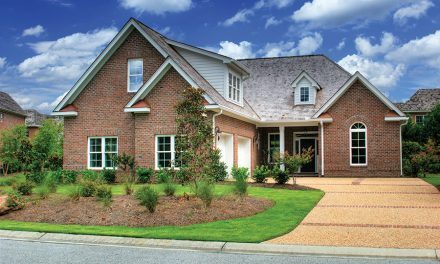 It’s a perfect fit for the classic Federal-style architecture, with a symmetrical façade, stately brick finish, and double-hung divided-light windows. It not only looks beautiful, but also blends in with the other nearby offices. Olympic Construction did the ICF install, and ensured the walls were straight, plumb, and flat, with no voids being seen in the concrete core when it was exposed during mechanical rough-in. Sub-trades commented that the installation was some of the best cast-in-place concrete work they have worked with, period. CMTA reports the office was completed on time and within budget. The project is the first LEED Platinum office building in Kentucky. It received a 2013 Environmental Award from the Lexington-Fayette Urban County Government Environmental Commission. Energy efficiency will always be the most important factor, and a thermally sound, energy-efficient building envelope will always be the most important component in overall efficiency. ICF Use: 9,835 sq. ft.